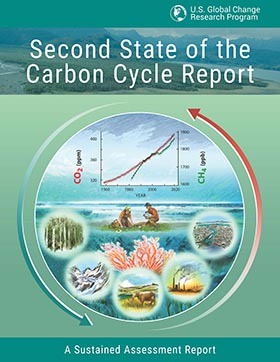 The 2nd State of the Carbon Cycle Report was completed in November 2018. SOCCR2 provides a current state-of-the-science assessment of the carbon cycle in North America and its connection to climate and society. The 2nd State of the Carbon Cycle Report (SOCCR2) is a scientific assessment of the carbon cycle addressing the GCRA (1990) foci (1) and (3), while simultaneously addressing the impacts of global change on carbon cycle components pertinent to the sectors specified in GCRA (1990) foci (2) above. SOCCR2 contributed to NCA4 Vol. II. NCA4, CSSR and SOCCR2 include common authors and federal leadership team members. All official USGCRP assessments are developed with approval and close reviews by Subcommittee on Global Change Research (SGCR) Principals. Additional information on SOCCR2 can be found HERE. What is the 2nd State of the Carbon Cycle Report (SOCCR2)? The Second State of the Carbon Cycle Report (SOCCR2) was led and developed by the Carbon Cycle Interagency Working Group (CCIWG) under the auspices of the U.S. Global Change Research Program (USGCRP). Contributing to the Fourth National Climate Assessment (NCA4), SOCCR2 is designed as a special interagency assessment focused on the advances in the science and the understanding of the carbon cycle across North America since the first SOCCR (2007). Specifically, SOCCR2 focuses on U.S. and North American carbon cycle processes, stocks, fluxes, and interactions with global-scale carbon budgets and climate change impacts in managed and unmanaged systems. The report includes an assessment of the carbon stocks and fluxes in soils, water (including near-coastal oceans), vegetation, aquatic-terrestrial interfaces (e.g., coasts, estuaries, wetlands), human settlements, agriculture, and forestry. It considers relevant carbon management science perspectives and science-based tools for supporting and informing decisions, as addressed in and related to A U.S. Carbon Cycle Science Plan (2011) and other documents, such as the USGCRP Strategic Plan (2012-2021) and the Global Change Research Act (1990). The status of and emerging opportunities for improving measurements, observations, and projections of stocks and fluxes in the carbon cycle, including uncertainty identification, are part of the Report. The development of SOCCR2 was guided by a SOCCR2 Federal Steering Committee composed of senior federal program managers from member agencies of the CCIWG, in regular consultation with the SGCR. The Writing Team comprises over 200 lead and contributing authors from the U.S., Canada and Mexico selected via an open nomination process. USDA, as the administrative lead agency for SOCCR2, was responsible for establishing procedures for the report, releasing Federal Register Notices, and certifying that the report meets Information Quality Act standards. Interagency review of the “Second Order Draft” by the SGCR Principals (November 8–23, 2016). Interagency review of the “Third Order Draft” by the SGCR (June 23 to July 21, 2017). NASEM committee review of the “Fourth Order Draft” (November 3, 2017, to March 12, 2018). Public comment period for the “Fourth Order Draft” (November 3, 2017, to January 12, 2018). Iterative reviews of multiple drafts by the CCIWG, SOCCR2 Federal Steering Committee members, Science Leads, Chapter Leads, Expert Reviewers, and Federal agency experts (September 2016 to July 2018). Following the public comment period and review by NASEM, the Writing Team revised the report in coordination with Review Editors who were selected via an open call to ensure appropriate responses to comments. SOCCR2 Federal Steering Committee (FSC) was responsible for the development, production, and content of the report as well as ensuring coherence, relevance, and responsiveness to A U.S. Carbon Cycle Science Plan, the Global Change Research Act and the USGCRP Strategic Plan. The FSC selected the Science Leads, the Chapter Leads, the Review Editors and initial contributing authors based on criteria, including scientific expertise and experience with scientific assessments. Federal Liaisons oversaw development of a given chapter and liaise with Chapter Leads in their development of individual chapters. Science Leads work across chapters to ensure scientific consistency throughout the report. Chapter Leads were selected from a pool of experts put forward through a public nominations process and led the chapter content development. Chapter author teams worked with Chapter Leads to develop and edit individual chapters in response to comments received during the multiple rounds of review. Contributing Authors selected via a public nomination process, provided discrete input to chapters. Review Editors were selected from a pool of experts put forward through a public nominations process. Their role is to ensure the authors adequately responded to all comments received during the public and National Academies review periods. The SOCCR2 report is mainly written for a scientific and technically savvy audience but also contains general audience targeted sections such as the brief report ‘Highlights’ written in plain language. The Executive Summary is designed to be understood by a broader general audience. The audience includes scientists, decision-makers in the public and private sectors and the general community across the US, extending to North American and global regions. The report is intended to inform policies but does not prescribe or recommend them. In that respect, it helps to inform mitigation and adaptation policies and management decisions related to the carbon cycle, supporting improved coordination for pertinent research, monitoring and management activities for responding to global change. Each chapter also contains societally relevant sections on carbon management, research gaps and future outlooks. What is the geographic scope of SOCCR2? The major focus of SOCCR2 is North America, with emphasis on the United States, which is consistent with the Report’s purpose of providing solid scientific information to U.S. decision makers and policymakers that could be used to formulate activities or policies, to the scientific community, and to academics for educational use in the classroom. Since the effects of changes in the carbon cycle is a global-scale issue, SOCCR2 addresses carbon cycling from a global perspective, where appropriate and discussion within other chapters or sections may include consideration of regional, continental, and/or global scales. Because SOCCR2 seeks to be consistent with the first SOCCR report (CCSP 2007), which focused on North America, chapters considered the carbon cycle in Canada and Mexico. The geographic scope of U.S. analysis for SOCCR2 includes the conterminous United States, Alaska, Hawai’i, and Puerto Rico. U.S. regional studies, if included, are presented where processes and impacts vary significantly across the nation and where regional information is available. Regional studies focus on NCA regions to best integrate with the fourth NCA report to be published in 2018. Some topics, examples, or analyses may involve scales below NCA regions, such as states or municipalities. What is the timescale of the science assessed in SOCCR2? This Report is focused on a time frame that is relevant to understanding and predicting the carbon cycle and the effects of changes to the carbon cycle up to the present day and/or extending into the near future. The emphasis is on the scientific understanding and developments in the last decade since the first SOCCR (CCSP 2007) which covered the science through 2005. The historical context may go farther back as appropriate, considering the data sources and the need to set the historical context. Model simulations may begin with preindustrial or geological time frames in order to converge with present-day estimations of carbon stocks or concentrations, landscape configuration, etc. For literature data and reviews, the time frame may vary depending on the focus of the relevant literature or model simulations. Chapters or sections describing the impacts of changes to the carbon cycle, mitigation plans, or adaptive strategies may also pose future scenarios. Finally, time frames used in SOCCR2 chapters were also based on the latest available and comparable carbon cycle data for all three SOCCR2 countries (U.S., Canada, Mexico) when assessed together. How are the SOCCR2 chapters organized?